US confectionery firm Hershey has announced a definitive agreement to purchase Pirate Brands from B&G Foods for $420 million. The “strategic acquisition” includes the Pirate’s Booty, Smart Puffs and Original Tings brands. Pirate Brands will operate within Amplify, Hershey’s ‘better-for-you’ snacking hub in Austin. Commenting on the deal, Hershey’s chief growth officer Mary Beth West said: “Pirate’s Booty is a leading cheese puffs brand loved by moms and kids as a better-for-you treat. We expect the full Pirate Brands portfolio to be a great fit for Hershey’s growing Amplify business which is targeted toward consumers who are looking for great-tasting snacks without compromise”. 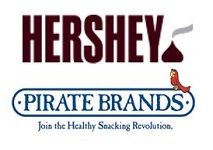 In a statement, B&G Foods president and CEO Bob Cantwell added: “Pirate Brands is a terrific business and we believe that it will thrive under the ownership of The Hershey Company”.